The life and times of Abraham Lincoln and how he became the president of the U.S.
Abraham Lincoln was a lawyer and politician who served as the 16th president of the United States. He is perhaps the most popular U.S. president of all time, not only because of his character, but also for his deeds. He worked to abolish slavery, carried the nation through its toughest war (the Civil War), made the federal government more powerful, and brought the American economy to great heights. In order to learn more about this remarkable man, this essay will explore his life. Born on February 12, 1809, as the second child of Thomas and Nancy Lincoln, in a log cabin on Sinking Spring Farm close to Hodgenville, Kentucky, his beginnings were simple. Thomas was an owner and leased out farms. However, by 1811, the Lincolns had to move due to a land dispute. The family relocated to Knob Creek Farm, where Thomas acquired 230 acres of land. Yet, by 1815, the family got into another land dispute and had to move again. Thomas got tired of these issues with land and sold off his remaining share in order to go to Indiana. By 1816, the Lincolns were in Hurricane Township, Perry County, Indiana. Abraham’s father thought that Indiana’s land laws were more reliable, and thus this move took place (Sandburg, Carl, and Edward C. Goodman). Abraham’s family had strong morals based on their Baptist beliefs: no alcohol, no slavery, no dancing, and more restrictions. The farm work was difficult, with lots of chopping wood, taking care of livestock, and other hard labor. Family life was not easy either. His mother died in 1818 due to milk sickness, and this meant his sister Sarah had to take charge of household duties. Abraham was only nine years old at the time, and his sister was 11 years old. A year after the death of his mother, his father got married to Sarah Johnston—a widow with three children. It is said that Abraham became very close to his stepmother in light of his mother passing away. Also, his sister Sarah died on January 20, 1828, during the birth of her stillborn son. This greatly affected Abraham, and these two deaths perhaps made him more introspective than most people his age (Donald, David Herbert.). Though Abraham was brought up on a farm, he was not particularly keen on doing hard labor. He was more interested in reading and writing. He enjoyed writing poems, reading books, and getting lost in learning knowledge. Abraham did not attend a proper school, and only had tutors who came by at times. However, he read widely and was continually fascinated in obtaining new knowledge. As he became a teenager, he started to take more responsibility for his chores and stood by the principle of giving his earnings made outside the home to his father until the age of 21. Known for his athleticism, he was skilled in axe work and also as a wrestler (Donald, David Herbert). In 1830, the family left to live in Illinois in Macon County. Scholars believe that this move was to help distant relatives who lived there obtain a more stable life. However, by 1831, Abraham decided to live on his own due to not being close to his father anymore—scholars say that since his father was not educated, he felt distant in his relationship with Thomas. He began his trip on his own by walking down the Sangamon River and settled eventually in New Salem. Although he worked as a freelance hard laborer for a while, he ultimately got hired as a deliverer of goods from New Salem to New Orleans, where he got first-hand experience of slavery. As he stayed in New Salem, according to Biography.com, “he worked as a shopkeeper, postmaster and eventually general store owner. It was there that Lincoln, working with the public, acquired social skills and honed storytelling talent that made him popular with the locals. When the Black Hawk War broke out in 1832 between the United States and Native Americans, the volunteers in the area elected Lincoln to be their captain” (“Abraham Lincoln”). It is hard to say how he made an impression on people, but he did, and he had clear leadership qualities from the beginning of his career. Speaking about impressions, he courted three women, but became serious about marriage with Mary Todd: an enthusiastic, educated lady from a wealthy family from Kentucky. Though their engagement was called off once by Abraham, they eventually married on November 4, 1942. But before this time, his political career was already in the process of development. As stated in Biography.com, “In 1834 Abraham Lincoln began his political career and was elected to the Illinois state legislature as a member of the Whig Party. It was around this time that he decided to become a lawyer, teaching himself the law by reading William Blackstone’s Commentaries on the Laws of England. After being admitted to the bar in 1837, he moved to Springfield, Illinois, and began to practice in the John T. Stuart law firm” (“Abraham Lincoln”). He was known to be excellent at cross-examination and providing evidence. His launch into politics was helped by his tremendous physical stature, his favor among locals for storytelling, and for being a hardworking individual who was brought up on a farm with high morals. During this time of being a lawyer, he served four terms in the Illinois House of Representatives as a Whig representative. Abraham supported the construction of the Illinois and Michigan Canal, voted to expand suffrage, and spoke out against both slavery and abolitionism. His loyalty to the Whig party showed, and he was eventually elected to the U.S. House of Representatives in 1846. In his two-year term, he co-wrote a bill to abolish slavery in the District of Columbia, enforcement for capturing fugitive slaves, and a popular vote for this bill. However, the bill failed in light of a lack of support from his party. Yet, he did much more during his term: opposed the Mexican-American War; supported a ban on slavery from land acquired from Mexico; and introduced the Spot Resolutions to determine on which territory soldiers died in the Mexican-American War. After his term was up, he was offered the position of secretary or governor of the Oregon Territory by newly-appointed president Zachary Taylor. However, Lincoln felt that the post was deep into Democratic territory, and would essentially end his political career (ARNOLD, ISAAC N.). Thus, after his term as a U.S. House Representative in 1848, he returned to Springfield, Illinois to practice as a lawyer. By this time, he had had two sons born to him: Robert and Edward. Unfortunately, Edward died in 1850, most likely from tuberculosis. The couple had two more sons, Thomas and Willie, but they also both died from medical complications. Robert was the only child of theirs that survived to have children of his own. These deaths caused Abraham and Mary to often be depressed, and Mary eventually visited a mental institution briefly (Steers, Edward). Up until the year of 1854, he practiced as a lawyer very productively. He took on big clients, and eventually earned the reputation of “Honest Abe.” But when the Nebraska-Kansas Act passed in 1854, which gave more sovereignty to the area in terms of slavery, Lincoln opposed it. He gave a speech called the “Peoria speech,” which detailed arguments against the Nebraska-Kansas Act. With this speech, he came back into the realm of politics. During this time, he began to leave the Whig party, as it was now split on the Nebraska-Kansas Act. In 1856, he officially joined the Republican party, which was bent on being anti-slavery. He was on the ticket for being vice president with John C. Frémont, although William Dayton won the nomination. However, through his speeches during the campaigns, he became the most significant Republican in Illinois (Lincoln). In the election of 1858, Lincoln won the popular vote for Senate, but Democrat Stephen Douglas won the legislative vote. Though Lincoln lost the race, the debates between him and Douglas are seen as the most famous political debates in U.S. history, and propelled him to being recognized as a true leader of Democratic party, and even a presidential candidate by newspapers. By 1860, Lincoln told his political allies that if they would be like to nominate him for president, he would accept the nomination. At the Illinois State Convention, May, 1860, he received his first endorsement for the presidential ticket. He went on to win the nomination at the Republican National Convention, and the party campaigned intensely for him through posters, pamphlets, leaflets, and newspaper editorials. 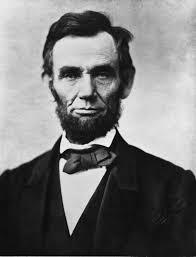 Lincoln did not give speeches, but instead monitored the campaign closely to see to its effectiveness. The campaign primarily focused on describing Lincoln’s humble beginnings, moderate attitude, and rise to the top of political power through hard work (Donald, David Herbert). This method of campaigning paid off. According to Biography.com, “In the general election, Lincoln faced his friend and rival, Stephen Douglas, this time besting him in a four-way race that included John C. Breckinridge of the Northern Democrats and John Bell of the Constitution Party. Lincoln received not quite 40 percent of the popular vote, but carried 180 of 303 Electoral votes” (“Abraham Lincoln”). His support came from the North and West. In fact, in 10 out of 15 Southern slave states, not one ballot was cast for him. Though Lincoln formed his cabinet with many of political rivals to make it more encompassing, the Civil War broke out due to the succession of Southern states and a rival government. Despite being president in the worst war America has ever been in, he signed the first Homestead Act to allow people to own land with greater ease, established the Department of Agriculture, signed the Morrill Land-Grant Act to give the opportunity for land-grant colleges to be created, established what was the become the IRS (Internal Revenue Service), issued the Emancipation Proclamation that led to the abolishment of slavery, established the U.S. National Banking System to provide a national currency and a financial network for the country, led the Union to victory in the Civil War, and made sure the defeated Southern states could join the Union without trouble. These accomplishments make him perhaps the most beloved president of the U.S.
Sandburg, Carl, and Edward C. Goodman. Abraham Lincoln: the Prairie Years and the War Years. Sterling, 2011. Donald, David Herbert. Lincoln. Reader’s Digest Fund for the Blind, 1996. “Abraham Lincoln.” Biography.com, A&E Networks Television, 17 Jan. 2019, www.biography.com/people/abraham-lincoln-9382540. ARNOLD, ISAAC N. LIFE OF ABRAHAM LINCOLN. FORGOTTEN BOOKS, 2016. Steers, Edward. Blood on the Moon: the Assassination of Abraham Lincoln. University Press of Kentucky, 2005. Donald, David Herbert. Lincoln. Simon & Schuster, 1995.